Danielle Bowling reports on some of the solutions available in concrete flooring for both residential and commercial applications. 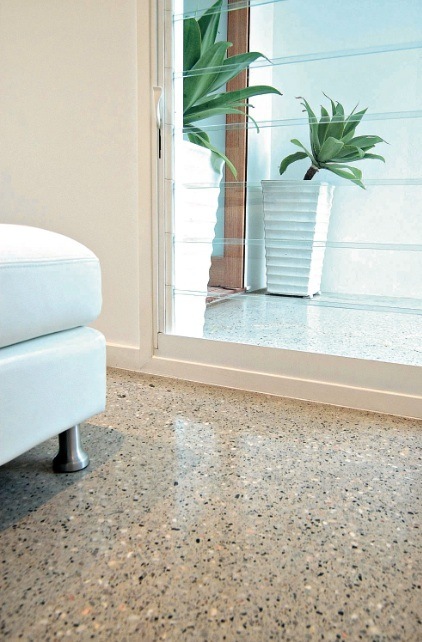 Often seen as a quick, convenient, no fuss flooring option, concrete is now a popular choice for design savvy home owners and businesses. Architects are being asked more and more to incorporate concrete floors into their designs for both internal and external applications, and Jodi Downey from Concrete Colours Systems says there are two main options in the market at the moment. “Honed concrete is where you grind the cement down just to reveal the stone so it’s got a matte look, and we’re finding that is very popular in patio surrounds and also in commercial developments as well ... And then polished concrete is more of an internal look and that’s where they grind it down and polish and buff it until it’s a flat surface, so it’s completely flat and polished,” she says. Concrete Colour Systems manufactures and supplies pigments for integrally coloured concrete and while polished concrete flooring options have always been popular in commercial environments and cafes, Downey says its popularity is growing in the residential market. “We manufacture oxide pigments which are used to colour concrete all the way through the slab, and basically what results is nice earthy tones to the concrete which can then be either just left plain or ground down into a honed concrete or polished concrete. We’re finding that that’s a lot more popular these days,” she says. The beauty of concrete flooring options, she says, are that they are generally very low maintenance and easy to clean. Long term, they are also very economical. “To start with it’s going to be a little bit more expensive than tiles to put down, however long term, with highly polished concrete you don’t need to keep resealing it. You don’t have issues with cleaning the grout lines, and it’s probably more of a classic look so it's not going to go out of fashion as much as tiles will. That’s the benefit of it,” says Downey. Not to mention the creative choices that are available now, including the countless colour options on offer. Daniel Kavo, metropolitan sales manager, concrete, at Boral, agrees that neutral colours are popular additions to concrete floors today. Kavo says that grinding concrete floors gives the property owner more design options as it exposes any colours or stones that they decide to add to the mix. “It exposes the aggregates, so you actually get a polished stone on top, so if you choose a black or a white or a red or a brown you actually see that stone come through the surface. You’re actually taking three or four millimetres off the surface of the concrete, so you expose that stone, which actually makes it unique and a lot of people put other products in, like mother of pearl or different colours of glass on top, so you actually change the whole look of the floor,” he says. Another bonus of using concrete flooring, and one that's now a serious consideration for many consumers is its sustainable properties. “In terms of the lifecycle of concrete, it’s a great product because it lasts a long time and these days with some of the enviro concretes that we produce, the carbon emissions from the initial source are being reduced so therefore it’s becoming more and more sustainable, plus if you use the right colours you tend to use less light in the house during daylight hours,” says Kavo. An example is Hebel’s PowerFloor concrete flooring product, which is more sustainable than regular concrete flooring options. An autoclaved aerated concrete, PowerFloor is a non-load bearing concrete floor attached to a timber or steel floor support structure and is typically used for second storeys. “A lot of consumers these days are wanting more out of their homes, and they look to concrete flooring, but a lot of the time it’s too expensive so that’s where Hebel comes in, because what the PowerFloor foes is it provides all the benefits of a solid, concrete floor, but at a significantly lower cost,” says Connie Bennett, product manager at Hebel. According to Bennett, PowerFloor uses 64 per cent and 34 per cent less greenhouse gas emissions that concrete and particle board flooring respectively. It can also be laid much quicker than standard concrete flooring, about sqm a day, and can be laid by any tradesman on site.